This self contained and fully equipped apartment with a small garden is located within 2 minutes walking to beautiful Papamoa beach and the beach access is right across the road (beach towels are provided). It is located right in the bubbly heart of old Papamoa yet still peaceful and quiet. Papamoa Plaza and Fashion Island are about a 10-minute walk away but if you want to take the car there is plenty parking there. There is a coffee shop on just about every corner in Papamoa and you will never have to go far to find a good place to eat. Mount Maunganui and Tauranga are only 15 minutes away and other tourist attractions (like Rotorua, White Island etc.) are never far away. Or just stay in the apartment and enjoy the sound of the ocean and the local birds. You will enjoy staying here as it's all here! -No parties and no additional guests staying beyond those booked. -No smoking in- or outside the property grounds. -No tents or additional overnight guests without prior permission. We are the van Dijk family, dad, mum and 2 teenagers and we have been travelling since before the children were born. We've been places, lived many places and still have a list of many places we would like to visit. This makes us always interested in tourists, tourism but also still exploring our own home town. Papamoa is a town in development so still new places to discover but treasuring the old which is what made us come to live here. Besides travelling and exploring we do like to stay home and do some gardening, lounging, watching movies or series, cooking and eating. We chose to live in Papamoa in this house simply because we love it here. The area is beautiful, all the convenience is close by and we go for a dip in the ocean pretty much every day. We bought our house with the flat so that our family and friends can stay with us without them feeling like they are interfering with our privacy. This way everyone has their own space, bathroom, kitchen and garden. Overall just a great place for a New Zealand getaway. Here you can enjoy some quiet time staying in the flat with the sound of the oceans' rolling waves in the background, or you shop till you drop. Or be active and go up the beautiful Papamoa Hills. Once you are up there, after a steep 20-minute climb, the views are just jaw dropping. Small but functional bathroom with shower, toilet, tub and washing machine. Bathroom essentials are all provided as well as toiletpaper and laundry powder. Bed is ready made on arrival. 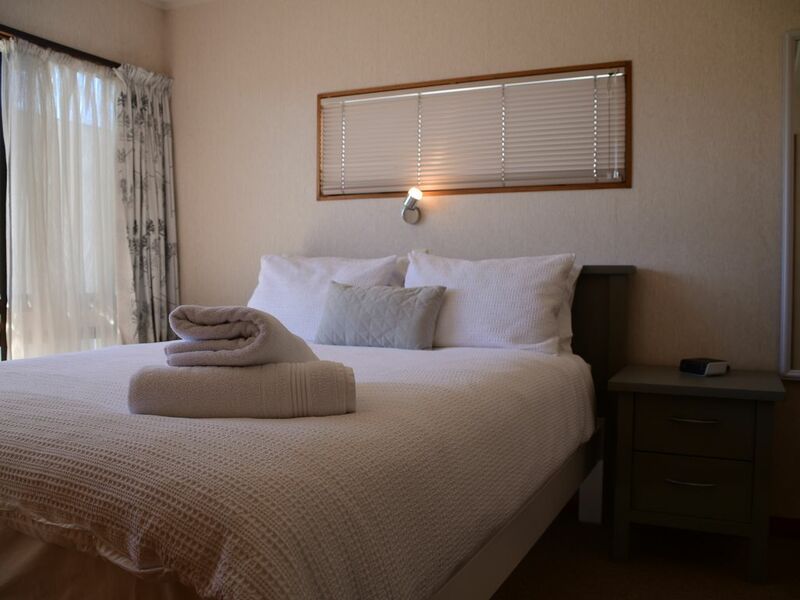 When staying longer than a week we will provide guests with fresh and clean linen. Clothesline next to apartment, however should a dryer be necessary guests can use the owners dryer. Super fast Wifi in the entire apartment. 4 Bathtowels, 2 hand towels and 4 face cloths are provided. Guests can always request for a change of towels. Traditional plunger along with ground coffee. Coffee, tea, sugar, pepper, salt and fresh milk. Dinnerplates, breakfast bowls, small plates, mugs, wine glasses, small and large tumblers 4 of each. Fully equipped kitchen with stove and oven, fridge and microwave. Kitchen utensils, pots, pans, cutlery, dinnerware, glassware are all provided as well as dishwash liquid, teatowels and handtowels. Round table with 4 comfortable leather chairs. Mainly informative books and magazines. Limited games present in the apartment. Nice outdoor area with outdoor table and 4 chairs, umbrella to shade you from the sun. Fresh herbs in the garden for guests to use. We really enjoyed our stay, and Danny was amazing to deal with. Unit was very quite and a good location and we enjoyed listening to the sound of the waves in the morning. Would recommend this place to other looking for a quite and relaxing space at the beach. Great location....close to beach, shopping and restaurants. Cozy place for two, close to the sea. Diner, bbq, parking space. Fully equipped (could use dehumidifier to help drying up clothes though). Owner is a very pleasant person. Recommend! Lovely place! Our stay was very relaxing, we would highly reccommend this place to anyone that needs accommodation in papamoa, Tauranga. This place is also very conviently located with not even a 5min walk to the very beautiful papamoa beach, and also a straight drive up to Mt Maunganui. And as for the property, it was more than enough with all the essentials, very tidy and cozy with a very friendly cat ?? 10 - 10, would definitely stay here again. Thank you Glyn, it was lovely having you and your girlfriend. Would definately have you again!